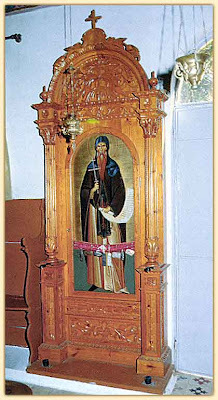 St. Anthimos, son of Ioannis and Antzouleta Kourouklis, was born on the island of Kefallonia in Lixouri in 1727, with the name Athanasios Kourouklis. At the age of seven he became blind as a result of smallpox, an epidemic in Palliki at the time. His devout mother prayed for his healing, and asked her priest at the Church of the Holy Apostles to serve forty liturgies ("sarantaleitourgo") for her son's healing. * At the fortieth Divine Liturgy, as the priest said: "With the fear of God, with faith and love draw near," Athanasius cried out that he could see the priest's vestments and chalice. He had recovered sight in his right eye. He then received his education by Abbot Anthimos at the Monastery of St. Paraskevi in Lepeda. For a time he followed his father's occupation as a seaman and travelled to Constantinople, but then took up the life of a monk when he was 20 at the Monastery of St. Paraskevi at Lepeda, receiving the name Anthimos in honor of the Abbot. At some point he went blind again, and soon thereafter had a vision: he was praying for the restoration of his sight before an icon of the Theotokos when two young men in radiant garments appeared and led him to the Mother of God herself, who told him, "Depart, for your continual prayer that I restore your sight is not profitable to you." But the two young men pleaded for him, and the Theotokos said, "Anthimos, because of your great piety and many prayers, I will restore your sight in part, but do not forget that, having gained temporal vision, you can lose that which is eternal." Thereafter, though Anthimos was almost completely blind, he could dimly discern the outlines of objects; but in compensation he was granted the gift of spiritual insight,and was able to predict the future and call by name those he had never met. Saint Anthimos was about twenty when he entered monastic life, and lived on Mount Athos at the Monastery of Iveron for a while where he received the Great Schema in 1747. Despite his blindness, he took up a life of missionary work as a "blind pilgrim monk" that took him throughout the Greek mainland and especially the islands. He decided this after a pilgrimage to the Holy Land where he stayed for a time. Traveling from place to place he preached the Gospel, healed the sick, and founded several monasteries. Once he even restored a blind woman's sight by his prayers, though he himself remained blind throughout his life. Throughout his amazing labors he maintained a life of the most severe asceticism by eating little and sleeping on a plank or on the floor. His work was so impressive that P.N. Politis, a professor at the University of Thessaloniki, declares him to be "a splendid human being and one of the most significant men of our Church in the 18th century". 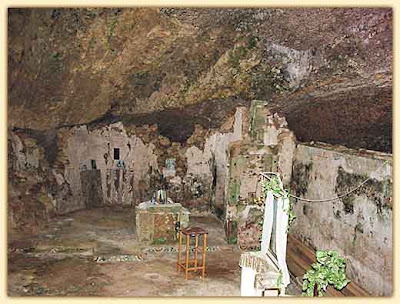 He spent a year on the island of Chios staying at the Church of St. Matrona (sleeping on its floor). He also spent time on the islands of Siphnos, Paros, Antiparos and Ios. While traveling from Siphnos to Paros he calmed a threatening storm through his prayers. In 1759 he saved the island of Megisti from drought through his prayers. A significant stopover in his blessed journeys is the island of Astypalaia where in 1760 he founded a magnificent convent dedicated to the Holy Theotokos Portaitissa, complete with sleeping quarters and protective walls, and the miraculous icon he requested be copied from the original on Mount Athos. 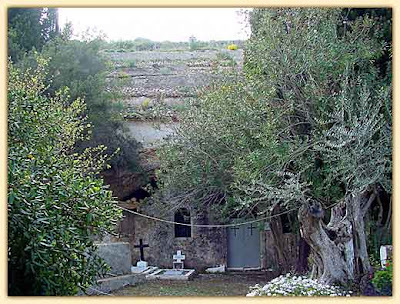 St. Anthimos stayed here for many years and worked many miracles, including ridding the island of snakes through his prayers. The devastating earthquake of 1767 in Lixouri, the defamatory campaign against the clergy at the time, combined with his nostalgia for Kefallonia, lead his footsteps back to Lepeda Monastery in 1769 which was by now in ruins. He salvaged and rebuilt it, turning it into a Convent populated by devout nuns. 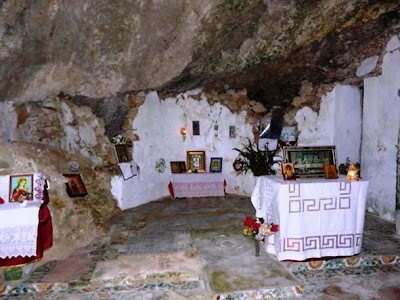 Following the restoration of both buildings and souls in Kefallonia, he continued his journeys, this time founding the Holy Monasteries dedicated to St. Anthony the Great in Sfakia of Crete in 1770, and St. John the Forerunner in Libadi of Kythera in 1773. At the latter, he dedicated the second throne of the chapel to his spiritual guide and the patron of his homeland, St. Gerasimos. 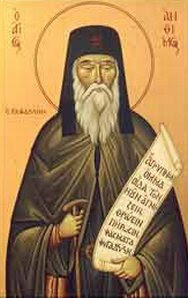 He moved on to Sikinos, founding the Monastery of Zoodohos Pege (Life-giving Spring) in 1775. He had thus created six "castles" of faith, six safe harbors and lighthouses that emitted the light of the Lord during the especially dark days for the nation. 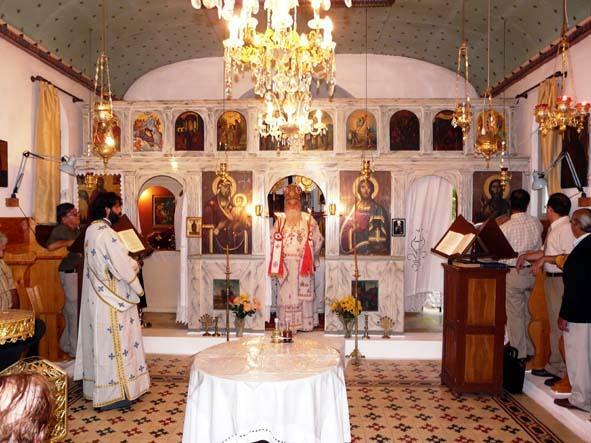 The operation of his monasteries is confirmed by a Patriarchal Decree of Patriarch Ioannikios. While living a peaceful and ascetic life back at his base at Lepeda, he received three letters from Mani, imploring him to go there and assist in bringing peace to local conflicts. He embarked on this journey aboard a small ship. Following a stopover in the Peloponesean village of Kelbasio, he arrived in Mani where his pious nature and prophetic charisma enabled him to intervene and bring the locals back on the road to salvation. It is at this point of having achieved the highest state of spirituality, that the Lord informed him that he was to leave this world behind. With this information, he went back to Lepeda, his place of solitude and repentance. In 1782, in the course of one of his many sea journeys, he told the sailors to change course for Kefallonia, saying: "God's will is not that I concern myself with it [the mission he had undertaken], but that I go back and die in my monastery." On returning he fell ill with jaundice and called his spiritual children to him, saying: "My children, the hour has come for me to go where the Lord ordains. Death is the common lot of us all and is nothing to be afraid of. It is important rather to do your best to keep your promises and your monastic vows. The one thing necessary in this life is to please God and save your souls." Having said this, he fell asleep in peace, at the age of 54 on September 4th, 1782. 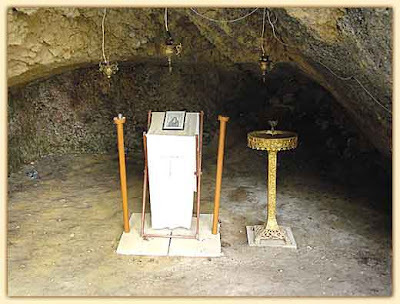 Restitution of his Sacred Remains took place in 1800 by Abbot Ioannis Lepediotis. In 1920, at the iniative of Amilkas Alevizatos, a Lixourian academic and Government Councilor to the Holy Synod, the Convent at Lepeda was properly recognized and incorporated as part of St. Gerasimos Convent - a status that is upheld to this day. The devasting earthquakes in August of 1953 destroyed the Convent to the ground. 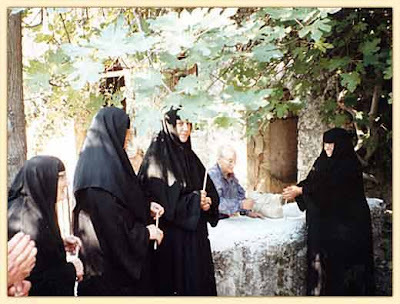 Hermioni Alexandropoulou, the only remaining nun, rebuilt the chapel and part of the nun's quarters with the assistance of the Holy Metropolis and devout locals. She also helped repopulate the monastery. 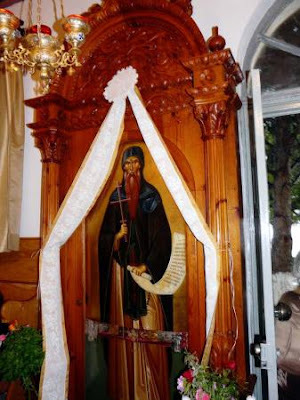 On March 28th 1973, Prokopios Menoutis, then Metropolitan of Kefallonia, transfered in a litany procession the icon of St. Anthimos from the Church of Pantokratoras in Lixouri, amid celebrations for the Declaration of St. Anthimos into Sainthood, which was issued by Patriarchal and Synodal Decree οn July 30, 1974. * It is sometimes said that celebrating Divine Liturgies for special intentions is 'not Orthodox.' The example of St Anthimos' mother shows that the practice is both traditional and efficacious. ** The monastery was extended and restored by a local builder, Mastrogeorgis, in 1779. At this time, it featured 15 monks' cells, a residence for the abbot, a dining room and a library. At its centre stood the church (katholikon) dedicated to St George, built in a style characteristic of the region, surrounded by a pebbled courtyard (votsala). Regrettably, the church and the external walling of the monastery are the only remnants of the entire elaborate structure, though plans are underway to restore the monastery to its former grandeur. The offspring of Palle and Kefallonia's torch, divine builder of the Monastery of Lepedes, we cheerefully praise Anthimos who defeated the adversary with asceticism. Having received the gift of healing from the Lord, fervently intercede for our salvation. Today, with a grateful spirit, the island of Kefallonia celebrates with the Monastery of Lepedes, and also invites the islands of the Cyclades. 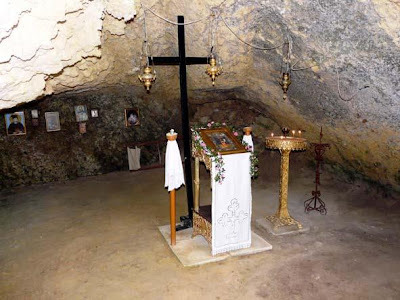 The islands rejoice because they received as great treasure your all-holy tomb, Anthimos, companion of the righteous. The renowned offspring of Lixouri, the pride of ascetics and the examle of monks, divine builder of the Monastery Lepedes, let us praise the thrice blissful Anthimos. 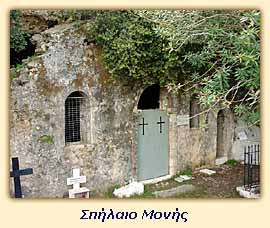 Underneath the church, and accessible only via a small trap door, is the so-called 'catacomb' of Saint Haralambos. St. Anthimos dedicated it to St. Haralambos because he is the patron Saint of Lixouri, the town where Anthimos was born. This small shrine was used as a refuge during the early years of the Greek Revolution and, again, during the bombardments from the Turkish coast in the First World War. The cave of St. Anthimos at Lepeda together with its nuns today are pictured below.